Low Carb Diet News - Tag Archive for "Coenzyme Q10"
…So if cholesterol isn’t the cause of heart disease, what is? Here’s the short answer: The primary cause of heart disease isinflammation. Small injuries to the vascular wall that can be caused by anything from high blood pressure to toxins attract all sorts of metabolic riff-raff, from bacteria to oxidized (damaged) LDL particles; the immune system sends inflammatory cytokines to the area, and more oxidation and inflammation takes place eventually resulting in the growth of plaque and, ultimately, to an increased risk for heart disease. If there were no inflammation, the arteries would be clear. The following is my seven point program for reducing the risk of heart disease. 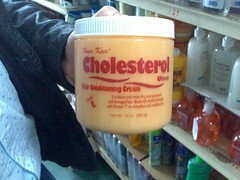 Note that lowering cholesterol isn’t on it. Note also that managing stress is. Stress is a powerful contributor to heart disease. The stress hormones create inflammatory events that may explain why 40% of atherosclerotic patients have no other risk factors. Eat an anti-inflammatory diet. The fruit and vegetable kingdom is teeming with natural anti-inflammatories like quercetin (apples and onions) and curcumin (turmeric). Drink green tea and pomegranate juice. Balance your protein and fat with tons of vegetables. And eat dark chocolate—it’s cocoa flavanols help lower blood pressure and keep the cardiovascular system healthy. Reduce grains, starches, sugar and omega-6’s (vegetable oils). Every one of these has the power to increase inflammation—a lot! Manage Your Stress. Stress is an enormous risk factor for heart disease, and is inflammatory as well. Find a way to manage it. Anything from regular walks in the park to deep breathing exercises to warm baths can help. Drink only in moderation. And if you don’t process the word “moderation” very well, don’t drink at all. Don’t smoke. Probably the number one recommendation for heart disease prevention. Supplement with antioxidants, vitamin C, Coenzyme Q10, omega-3’s, curcumin, citrus bergamont. Antioxidants like vitamin C protect against oxidative damage (one of the promoters of heart disease) while omega-3’s are one of the most anti-inflammatory molecule on earth. Curcumin does just about everything—it’s an anti-inflammatory andantioxidant.